If you are looking for a no contest cheesecake recipe, this is hands down the absolute best I've ever had. No joke. It's rich, sweet, creamy, decadent, die-and-go-to-heaven scrumptious. This month the Blogger Recipe Challenge group was sponsored by Modena Fine Foods. We were each sent a variety box of three balsamic glazes to test out. Have to say, the strawberry balsamic glaze was my absolute favorite and I knew in an instant it was the perfect garnish for this Strawberry Cheesecake. Finely grind oreo cookies. Add melted butter and sugar, and gently mix with a fork to combine and fully coat the crumbs. Press into a 9" spring form pan and set aside. Preheat oven to 220º F.
In a large mixer, on low, combine room temperature cream cheese, sugar, flour, and salt until smooth. Add in 4 full eggs, plus 2 egg yolks one at a time until thoroughly incorporated. Add vanilla and sour cream, and beat until combined. Pour cheesecake mixture into pan and bake for 90 minutes. Increase temperature to 300º F and continue to bake for another 15-20 minutes. Cheesecake should be firm, and very lightly golden. Remember to run a knife around the edge of the cheesecake as soon as it comes out to help avoid any possible cracking. Allow to cool to room temperature before covering placing in the fridge 3-24 hours. So, as I said earlier our Blogger Recipe Challenge Group was sent a variety pack of Blaze Balsamic Glazes by Modena Fine Foods. They included their original balsamic glaze, a fig balsamic glaze, and a strawberry balsamic glaze. Hubby and I tried the fig one out on some steaks, but I think next time we do that I need to make some tweaks. The glaze didn't stay on the steak well while grilling, so that'll definitely be a do-over. 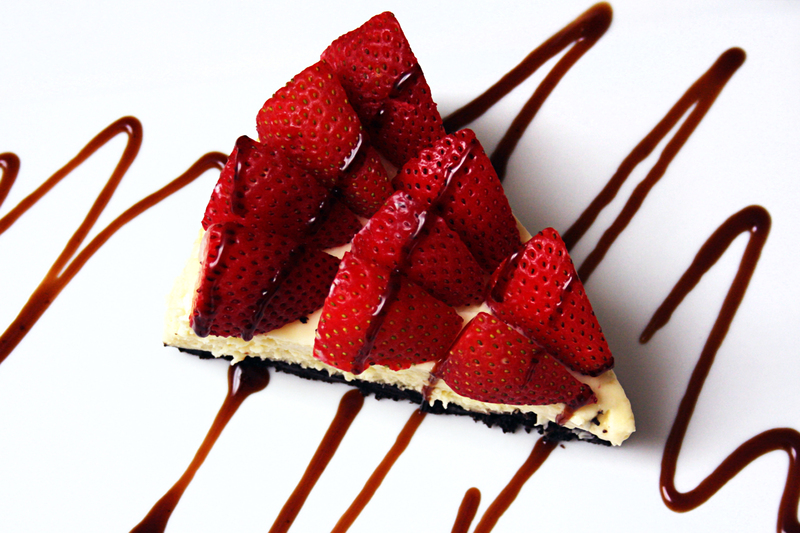 However, the second I tasted the strawberry balsamic glaze I KNEW that it would be perfect as a dessert topping. It wasn't overly balsamic-y (I'm sure you know what I mean by that), and had a wonderful hint of strawberry flavor. Just a little drizzle over the cheesecake, and the flavor went from amazing, to blow your mind incredible. The best part, is that you don't need much to get that boost of flavor. I'm not a huge fan of pie-filling consistency cheese cake when I'm wanting fruit on them. There's just too much sugar, and too much of... well, everything. I will definitely be making this recipe again, and DEFINITELY be using the Modena Fine Foods Blaze Strawberry Balsamic Glaze. I might even pick up a couple of the variety sets to give as gifts to those friends and family members in my life that love cooking. So many varieties of awesome and so little time... and stomach room. *I was provided Blaze Balsamic Glazes free of charge from Modena Fine Foods in order to facilitate this review and recipe. All opinions are 100% mine. See Disclosure Policy. This recipe... my goodness I don't even know how to begin to explain it. The pancakes are fluffy and the perfect consistency. Between using King Arthur Flour (another one of our amazing Blogger Recipe Challenge sponsors), and sifting the dry ingredients, you can't go wrong. 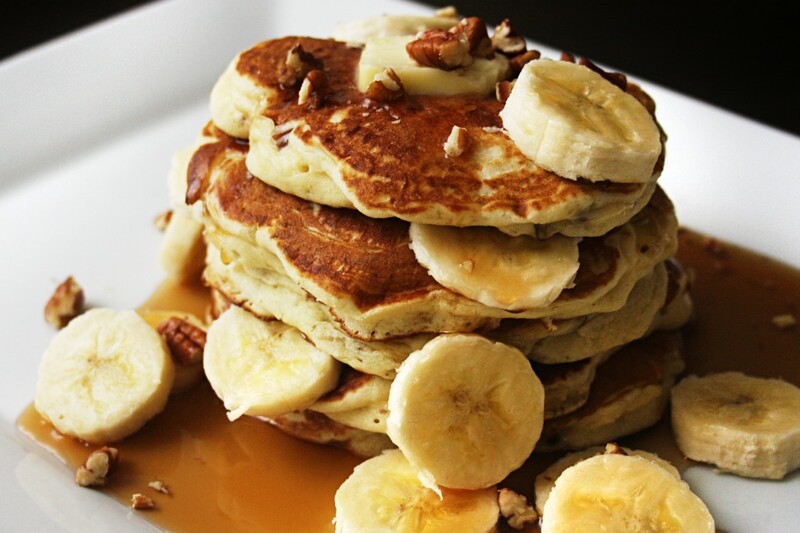 With the banana added into the batter (and used as a garnish), you almost don't even need syrup. Which is awesome because that stuff isn't all that great for you. A little crunch from the added pecans, and yumm. I was smacking my lips for a good 10 minutes after finishing my portion. * Note: You can also buy actual buttermilk, or separate heavy cream into buttermilk and butter fat. Sift together flour, sugar, baking powder, baking soda, and salt. Once milk has soured, mix thoroughly, then combine egg and melted butter. Use a fork or whisk to mix. Combine dry ingredients with the buttermilk mixture. Use a fork or whisk to mix until all lumps are gone. Quarter and slice banana into pieces. Add to batter. Coarsely crush pecans 1/4 cup of pecans leaving some out for garnish. Add to batter. Using a non-stick skillet that has been heated on medium (a few drops of water should quickly sizzle and bubble when pan is ready), add your batter 1/4 cup at a time and cook. Watch for bubbles to form on the top, and then flip pancake over to finish cooking. Each side should take 1-2 minutes-ish. You may need to adjust the heat as you go. Too hot and the outside will burn before the inside has cooked. Serve immediately. Use additional sliced banana and crushed pecans as garnish. Add butter and syrup to suit your personal tastes. For our baking challenges King Arthur Flour sent us each a free product coupon so we could grab from the store what we wanted. They offer varieties including the unbleached all purpose flour that I chose, bread flour, whole wheat flour, organic, and even gluten-free. I had heard of King Aurthur Flour but we almost always opted for the store brand just to save a couple of cents. Being a novice baker I never realized how differently a store brand of flour is compared to a name brand such as King Arthur. But it does matter. I've seen such an improvement in the overall consistency and texture of my baked goods. I absolutely love cooking/baking with King Arthur Flour. I've been using their Unbleached All-Purpose Flour to make my Naan, roux for my soups, and I have a Red Velvet Cake planned in the next week that I'll also be posting for this challenge. It really does perform beautifully. It rarely clumps, and has a fantastic consistency that creates light, airy doughs and baked goods. I'm sure that sifting the flour helps, but hand down this is the best flour I've used so far, and even if it saves me a few dollars I don't think I'll be going back to the store brand anytime soon. *I received the above mentioned product free of charge from King Arthur Flour in order to facilitate this review. All opinions are 100% mine. See Disclosure Policy. It's a new month which means a new Blogger Recipe Challenge! This month we're going with Meatless May. Yumm. I love vegetarian cooking. Although, I have to admit I still think fish is a meat. But I guess some people don't? Anyway, our little cooking group was sponsored by Starkist for this month's challenge. We're each going to whip up two recipes using Starkist's products. We were all sent 2 packages each of their Herb & Garlic, Hickory Smoked, Sweet & Spicy, and Zesty Lemon Pepper. They're ALL really yummy by-the-way. 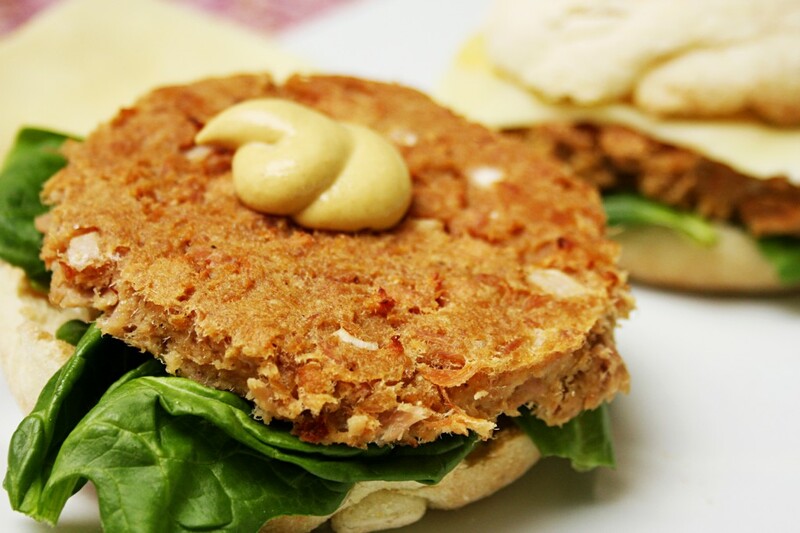 For my first recipe I decided to use up the two packages of Starkist Hickory Smoked Tuna to make Hickory Smoked Tuna Burgers. The concept is a little odd, but the result is a light, tasty burger. *Note: You can adjust just about all of the ingredients to suit your personal tastes. Lightly grease a cookie/baking sheet. Combine all ingredients. Mixture will be a little wet and sticky. Bake for 20 minutes on lightly greased cookie/baking sheet. Toast English Muffins to desired crispness. I have seen some people on Starkist's Facebook page complaining about bones in their tuna. First of all, the package states that there may be bones. Secondly, I've NEVER had a single bone in ANY of the tuna I've purchased, whether canned or single serve. Since I'm not planning to cook with it, I did want to mention that I LOVED the Herb & Garlic variety. It was absolutely scrumptious and flavored perfectly without any extra water/oil. I'm kind of a minimalist when it comes to preparing fish. Give me a butter sauce and a nice fish filet and I'm set. I had never cooked with tuna before, and only added mayo in order to make a sandwich. Once while I was pregnant I got a wild hair up you-know-where and added some curry powder. (Which was the best thing ever at the time.) However, I was extremely impressed with the flavors of these pouches. Definitely a product I would recommend, and cook with again. Which, lucky for you, will be happening in the near future! Make sure you keep checking the linky as the month progresses. We've got 10 bloggers creating 10 recipes each! There are sure to be some fantastic goodies popping up. *I received the above mentioned products free of charge from Starkist in order to facilitate this recipe and review. All opinions are 100% mine. See Disclosure Policy. I was first acquainted with Ben & Jerry's when I was a Sophomore in college. Imagine it. Six girls... with six different diets/preferences in food... with one stove, and one sink. Needless to say, I used a lot of my dining cash at the campus convenience store, and more often than not, my dinner was Ben & Jerry's Cherry Garcia. Yumm! I really don't know how I didn't balloon up 10 sizes, but instead of hating myself for consuming several pints of ice cream a week, I started my permanent love affair with good ol' Ben & Jerry. Ben & Jerry's sent enough coupons for me to pick out 5 different flavors to review! I tried to go with some new flavors, but the entire concept of "new" tends to be lost on us Maine folk. So, I went with some that I hadn't tried yet, plus a fallback. Talk about flavorful, sugary goodness overload. I didn't even know where to begin. I'm the type of person that will stick with a flavor because I know I like it (and we all know Ben & Jerry's is a bit of a splurge so the flavor you choose HAS to be worth it). I sent the husband out to Target, and after about 10 minutes of figuring out which flavor contained what, I settled on Coffee Caramel Buzz, the oldie, but goodie Cherry Garcia (chalk it up to nostalgia), Chocolate Therapy, Volun-Tiramisu, and Chocolate Fudge Brownie. As you can see, it was one of THOSE weeks. I went pretty heavy on the chocolate and the coffee when selecting my flavors. And for the sake of maintaining freshness (just nod your head and smile), the eating of the review items was completed before the idea of taking a picture crossed my mind. I can also say that I didn't think it was fair to taunt you anymore than you already will be by the end of this review. Ben, Jerry and I had quite the adventurous week. They came along with me over to a friend's house! I figured 5 pints was way too much to power through without the excuse of being pregnant, or a starving student, so I offered her one of mine. She decided to go with the Chocolate Fudge Brownie, and LOVED it. This particular flavor is pretty self explanatory and more along the lines of traditional. It's just chocolate ice cream with chocolate fudge brownie pieces. It really is the perfect PMS ice cream. (Oh com'on, you know you were thinking it too.) 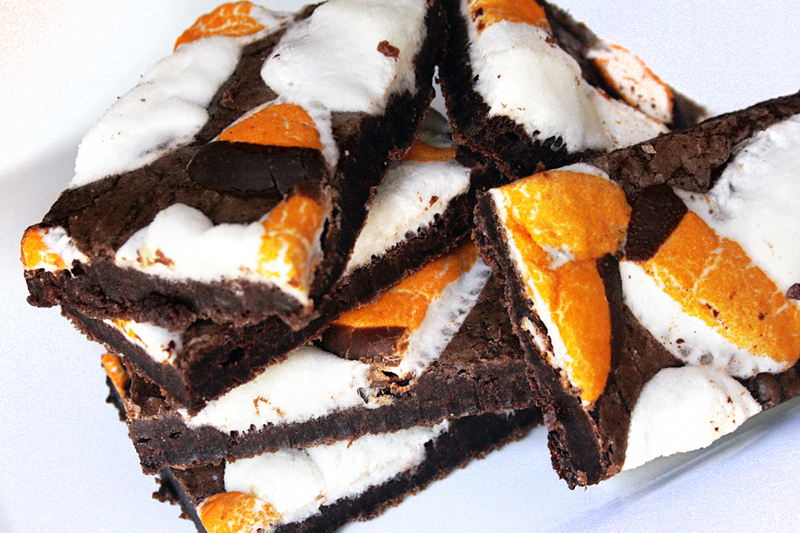 It's simple, but hits that screaming chocolate sweet tooth and makes it quiet down for the time being. Volun-Tiramisu came along for the visit too, but this one didn't receive quite as much love from me. I actually passed it off onto the husband - who then devoured it and said it was one of his favorite flavors. Go figure. Volun-Tiramisu is actually an exclusive flavor to Target, or at least that's what I read online. I couldn't find it on the Ben & Jerry's website. Volun-Tiramisu is comprised of coffee marscapone ice cream, with cocoa dusted, coffee rum lady fingers. It tasted JUST like tiramisu which is probably why it wasn't my favorite. I like the coffee, I like lady fingers, I like the cocoa, I'm totes cool with rum, but... there's something about a soggy pastry that just doesn't sit right with me. Couldn't get past it in Olive Garden, couldn't get past it in Ben & Jerry's. I've always been a fan of Coffee Heath Bar Crunch, and since toffee isn't all that far off from caramel, my guess was that the Coffee Caramel Buzz ice cream was going to be pretty downright fantastic. I was right! (I love being right.) If I could have my way, instead of having my morning cup of coffee, I would just eat the Coffee Caramel Buzz. It was very close to a caramel macchiato from Starbucks. Made with coffee malt ice cream, whiskey caramel swirls & English toffee pieces, Coffee Caramel Buzz definitely shot its way up to my list of favorites. 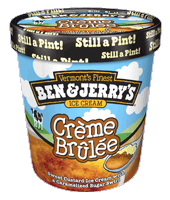 Right up there with Cherry Garcia (more on that later), Creme Brulee, Half Baked, and Coffee Heath Bar Crunch. I pretty much have a flavor to fit whatever mood I'm in. Now, I don't think you can ever really go wrong with Cherry Garcia. It's cherry ice cream, with huge maraschino cherries, and massive chocolate chips (although described as fudge flakes). It's one of those flavors that you can just eat, and eat, ...and eat because it isn't weighed down by a lot of dough/batter/swirls, etc. I like eating it and pretending it's a chocolate covered cherry, but there just isn't quite enough chocolate to really get the full effect. When I realized the last two flavors I had left were Cherry Garcia and Chocolate Therapy, the light bulb went off. EAT THEM TOGETHER. It's so simple! Chocolate Therapy is a fantastic ice cream, and I never thought I'd ever say this, but it was almost TOO much chocolate for me. I'm talking this being "Shark Week" chocolate ice cream worthy. If you don't get that reference, just don't worry about it. You'll be glad you don't know. Anyway, it truly was a delicious ice cream, but I prefer to sit down and pig out and eat half of a pint or more at a time, and with this one after two bites I had to call it a draw. So, I mixed it with the Cherry Garcia. About 2/3 Cherry Garcia, to 1/2 Chocolate Therapy, and voila! You now have chocolate covered cherry flavored ice cream. Best combination EVER. 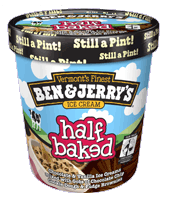 Ben & Jerry's is giving away 5 FREE product coupons to one lucky DealPeddler reader! You must be a legal resident of the USA who is 18+ in order to be eligible. Giveaway will start 11/18 and run for approximately 1 week. When the giveaway is live, you'll be able to enter [HERE]. *I was provided with the above mentioned products free of charge in order to facilitate this review. All opinions are 100% mine. See Disclosure Policy. Every once in awhile I get a wild hair up my a... and decide I want to try my hand at cooking something new. Trust me, it doesn't happen often. But, when Gorton's offered me the chance to try out one of their frozen fish products, I was super excited. I love fish, but the rest of my family can take it our leave it (and usually leave it). I was asked to pick out a product that has a 200 calorie or less serving size. Personally, I don't really care what the calorie count is in something, but Gorton's just introduced a new product line, and they wanted to get the word out. In addition to their new products, Gorton's is also promoting research showing that eating fish at least twice a week is also extremely healthy! (Who doesn't want to be healthier?) I always knew fish was high in omega-3s, but never really knew what the true health benefits are. 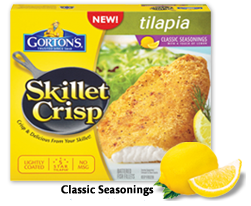 After a little deliberation over the phone with my husband about which product we should get, we decided to go with the Gorton's Skillet Crisp Tilapia in the Classic Seasonings with Lemon variety. I had already started brainstorming some meal ideas. I knew the fish was going to be a bit crispy so I wanted a side dish or two that would balance the harder outer texture of the fish. (I try to make my meals toddler/teething friendly.) I also wanted to balance out the lighter lemon flavor of the fish with something a little less acidic for a contrasting flavor while at the same time complimenting the fish with another brighter, more aromatic flavor. I don't usually try very often to make the aesthetics of a family meal super appealing, but since I was feeling creative (maybe I should say I was feeling brave) I wanted to make sure my dish wasn't all that wonderful golden brown color. You know what I'm talking about? When you have any sort of fried food paired with more fried food, and then a veggie like corn. It all looks the same and isn't super appealing. This is what I came up with: Gorton's Skillet Crisp Tilapia (Classic Seasonings), served over a bed of creamed spinach, with a side of roasted roma tomatoes. Sounds delicious, right? The best part, is that the entire meal is super easy to make! Make sure the spinach is fully cleaned. Give several cold water baths if necessary. In a large pot, bring salted water to a boil. Boil spinach for 1 minute. Drain. Rinse with cold water until cool. Squeeze out any excess water. I decided to leave some of the water in for a thinner cream sauce. Put spinach back into pot. In a medium/large sauce pan heat butter on medium until melted. Add minced garlic, and chopped onion. Cook 3-5 minutes until onions are soft. Stir occasionally to avoid burning the butter and having the onions stick to the bottom. Add salt and pepper to taste. Add in the cream cheese cut in pieces, and milk (I used whole milk), and stir until the cream cheese has fully melted and is smooth in texture. 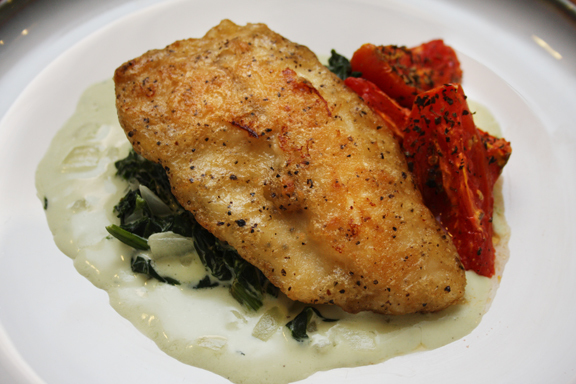 Mix cream cheese sauce in with the drained spinach. Simmer 8-10 minutes until sauce thickens. Because I had a little extra water I simmered mine closer to 20 minutes. Bake 25 minutes. Turn off oven, and let sit in the oven an additional 10-15 minutes. Tomatoes should look soft, slightly wrinkly, and juicy. I have to say, this meal was a HUGE hit. Everyone ate the Gorton's Skillet Crisp Tilapia! The fish was delicious, which is something I wasn't really expecting with it being frozen. The outside was crisp, and the inside was juicy. The lemon wasn't overpowering, and was seasoned perfectly. Definitely a product I would purchase again! For only $3.99 I had enough fillets to feed my entire family, and it was so simple to just put into a skillet and heat up. No second guessing. I didn't have to bread it myself, and figure out how much oil to use. It was just heat and serve and tasted almost as good as fresh fillets would have. My husband even said my meal belonged in a restaurant, he was THAT impressed with the fish, and the rest of the sides. Make sure you check out Gorton's online for more recipes and information about their new and existing products including nutritional facts. You can also find Gorton's on Facebook and Twitter. Gorton's wants to offer a $2/1 coupon and a Gorton's plate as a giveaway prize for THREE DealPeddler readers! Giveaway will run for 4 days. Must be 18+ and a legal resident of the USA in order to qualify. When the giveaway is live you'll be able to enter [HERE]. *I was provided with a free product coupon to purchase a Gorton's frozen fish product in order to facilitate this review. All opinions are 100% mine. See disclosure policy. I'm not much of a cook, and since my family doesn't like guac (I think there is something wrong with them), I took the traditional route, and used it as a dip. I think I had chips and guac for a week straight - breakfast, lunch, and dinner. We're talking Wholly Organic Guac, Pico de Gallo, Guac & Spicy Pico, Spicy Guac, Classic Guac, Chunky Guac, 100 Calorie Guac Packs, and of course the salsa! Whew, that was a guac-full, erm I mean a mouth-full. My absolute favorite was the Guacamole and Spicy Pico. I like my foods to have flavor and texture. This really was the perfect combination for me. The guac was a little chunky and on the bottom, and on top was a nice layer of pico. It had that nice kick to it along with a great texture. It wasn't just smooth. I also really liked the plastic container it came in, and the fact that it had a lid. Scrumptious! I ate that first, and devoured it within an hour. My next favorite was the Spicy Guacamole. This is guac mixed with salsa. Wasn't quite the same texture, but it had that nice kick breaking up the monotone flavor of the avocado. I was so overwhelmed with guac I forgot to freeze some of it, so unfortunately a few containers went bad before I had the chance to get to them. (You can freeze Wholly Guacamole for up to 3 months!) However, all of the Wholly Guacamole I tried was great. I just had some personal favorites. I did really enjoy the Original and Chunky Guacamole too, but it was a little dull. We happened to be having tacos for dinner one night, so I put some of the Original Guacamole on the tacos and had a great array of flavors. The 100 Calorie Wholly Guacamole Snack Packs were great for when you want just a small snack. Honestly, I ate two at a time, so maybe they should make these 200 Calorie Snack Packs? This is great to take to work with you to eat at your desk, or give the kiddos when they're wanting a snack but not needing a full meal. They open easily, but I thought the packaging was a little flimsy. I couldn't get to all of the guac because of the creases. I'll admit it. I licked the packaging. Shhhh! The Mild and Medium Wholly Salsa is getting mixed reviews from me. I like how fresh it tasted - like it just came out of the kitchen. I thought that was a great bonus, because some of the salsa that lasts forever just has a very processed flavor. However, I didn't like the texture. It was too fine, and seemed a little too pureed. Keep in mind that judging food is very subjective, kind of like art. Everyone has a different pallet, so just because I didn't like the food doesn't mean it's bad, it just means it wasn't something I personally liked. They do have 5 brand new flavors of Wholly Salsa (which include the Avacado and Spicy Pico that I tried) that sound super yummy though: Red Pepper Mango, Roasted Tomato, Pineapple, and Avacado Verde. 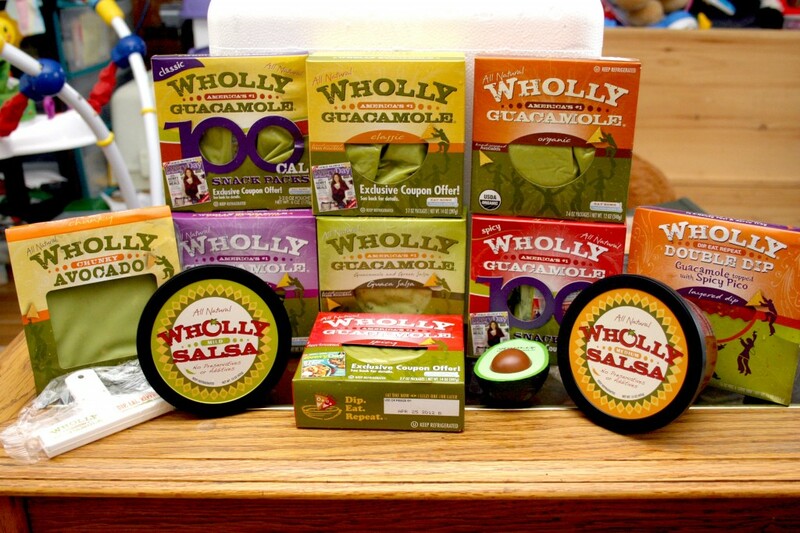 You can find Wholly Guacamole on Facebook and Twitter! If you haven't yet, you should because they release some pretty great coupons, have contests, and random giveaways. Wholly Guacamole is also offering DealPeddler readers the chance to win a Cooler Full of Guac similar to the one I received! You'll be swimming in guac and loving every minute of it. Giveaway will run for approximately a week. You'll be able to enter [HERE] during the duration of the giveaway. Entrants must be 18+ and live in the USA. * I received the above mentioned Wholly Guacamole products for free in order to facilitate this review. All opinions are 100% mine. See Disclosure Policy. I've been holding out on you! Well, not really. I wanted to save this particular review so we could end Earth Month with a big bang. 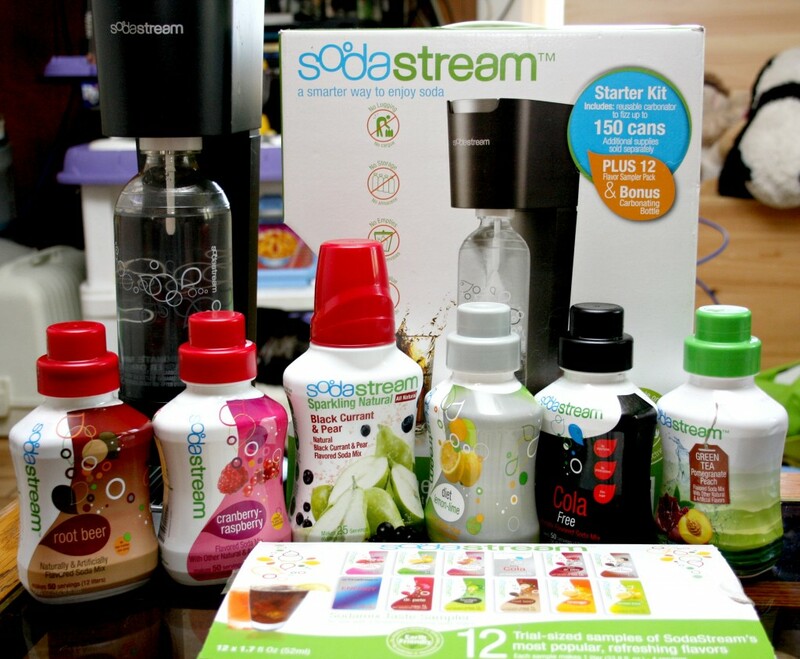 I had never heard of the Soda Stream until I saw it around the bloggersphere. My family and I are not particularly big soda drinkers, mainly because it's an expense we don't need to have, and I personally don't like all of the bottles and cans it creates. I also don't care for the negative health factors that accompanies soda drinking. I figured that a Soda Stream might be the exact solution we are looking for. Soda Stream sent me the Genesis Soda Maker. This came with two plastic bottles, a big CO2 cartridge, and a bazillion flavors. We're talking cola, ginger ale, fruity flavors, diet flavors, lemon lime - oh my gosh so many flavors! My favorite was the Raspberry-Cranberry flavor. My husband broke into the box before I was able to, and before even reading any instructions he went full steam ahead making his first bottle of soda. I'm laughing just thinking about it. He managed to get soda water everywhere... TWICE! I had seen a video review of the Soda Stream before and knew exactly why it happened, so as a quick suggestion for anyone who buys this or wins this - Read the instructions. I like that the Soda Stream is really easy to use. It doesn't take much to put it together and within seconds you are literally making your own sodas. Just a few pushes of the carbinator, and a cap-full or so of your favorite flavors, and voila! You have a bottle of soda that you can store in the fridge if you don't want to finish it, or take with you to work. Heck, buy a Soda Stream for your office if you want easy access. It definitely beats going down to the vending machine and paying a dollar or two for a tiny bottle. I also think the size is great. It normally sits on the edge of my over-flowing kitchen table and takes up very little space. There were only a few things I didn't like, and it isn't really related to the actual Soda Stream machine. I would have liked the caps to have poured neater. If you don't wash the cap out after each time you flavor your soda water, they get really sticky and begin making a mess. It's not a huge deal, but something I would like to see improved in the future. I also noticed the soda water loses its carbonation quicker than store bought sodas. That doesn't bother me because I happen to like my soda a little flatter, and if I want it to last longer I carbonate it to the max. It does last for several hours, but if you need to keep your soda for longer than 3-4 hours without it losing too much carbonation, I'd suggest putting it in the fridge. Every once in awhile there is a method to my madness. I have been sitting on this review for several weeks. Of course I wanted to try it out for a long time, but I also thought it was a perfect review for Earth Month. I found online that it takes a plastic beverage bottle up to 450 years to decompose. That is just ridiculous! For those that don't live in a state where you can take them into a redemption center for a little extra cash, how many people choose to toss those bottles instead of recycling them? The Soda Stream is a great solution to this issue. Yes, it's a little bit of an investment, but in the long run it saves money, but it also helps keep hundreds upon thousands of bottles out of the landfill. On the Soda Stream web site they have a little ticker of how many bottles they are saving the world from. Right now it's up over 1.7 BILLION! According to their site, 1 one their reusable bottles saves the world from an average of 2,000 bottles and cans. I mentioned that I wasn't thrilled with all of the health issues that seem to accompany soda drinkers. We all know the sweeteners aren't great for you, especially the aspartame. I was thrilled to learn the following when checking out Soda Stream online. You can taste a difference. It's a small difference, but it is there. At first I wasn't all that happy about it, but after a few goes with the Genesis and finding my favorite flavors, I would much prefer drinking what I'm able to create with my Soda Stream versus pumping all of that sugar and other crud that accompanies many soda brands into my body. It may not be a huge healthy change for us since we drink soda probably not even once a week, but now that we have our Soda Stream it's every few nights, and it is a much healthier option. Overall, I love it. I may not have gone out and purchased it myself, but that's only because of how little we drink soda. I think it's a wonderful product! It's very well made, will last a long time, convenient, healthier, better for the environment, and a good investment. I've already had family members and friends asking where I got mine and where they can purchase one. 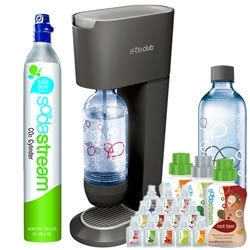 FYI - you can shop the Soda Stream Store online, or check out all of their retailers. Some retailers will have a carbinator exchange program and others will not. 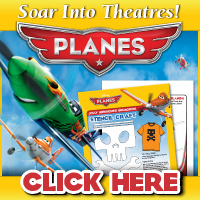 But you can see what each store near you carries by putting in your location [HERE]. I love this thing, and it is actually FUN to use! So, I am beyond excited to tell you that you will have a chance to win your very own Soda Stream! When the giveaway is live you will be able to enter [HERE]. Open to age 18+ residents of the continental USA. * I received a product for free from Soda Stream in order to facilitate this review. All opinions are 100% mine. See Disclosure Policy. What do you do when a giant box of food shows up at your door? First, stop drooling. Second, you of course start eating! 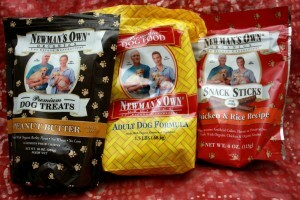 Newman's Own Organics sent my family and I a huge box stuffed to the brim with delicious organic treats. 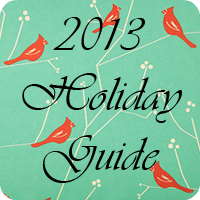 Everything from cookies, to candy, mints, pretzels, and fig bars. And, because we happened to have two dogs and two cats, they also sent along treats and food for our four-legged moochers. Before I continue on, I want to clarify that Newman's Own Organics and Newman's Own are two separate companies. Newman's Own Organics began as a division of Newman's Own in 1993, but then branched off in 2001. Now that we've straightened all of that out, it's time to check out the goodies. As I said, the box was full of awesomeness. I'm going to admit we actually ate some of it before taking the photos (the box happened to show up right as we were discussing going grocery shopping), and then my daughter thought she'd be helpful and "twash" the packages. So, what was in the box? We received their entire line of chocolate cups including mint, caramel, and peanut butter in both dark chocolate and milk chocolate. 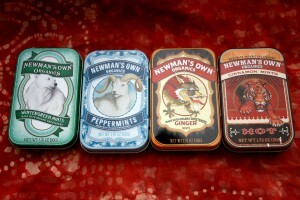 We were also sent four tins of mints: peppermint, ginger, cinnamon, and winter green. 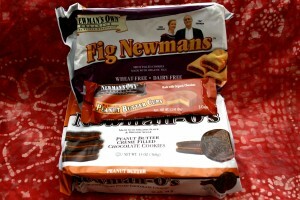 As I kept digging I unloaded two packages of Fig Newmans in low fat, and wheat & dairy free, two packages of Newman-O's cookies in chocolate cream, and peanut butter cream, two bags of pretzels, and two bags of dried fruit in cranberry and mixed berry. Nope. I'm not done. 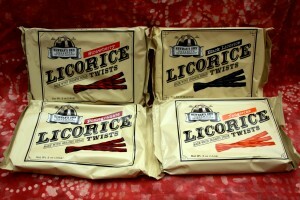 There were also four packages of licorice in tangerine, black, strawberry, and pomegranate, ginger snap cookies, hermits, cinnamon grahm alphabet cookies, double chocolate cookies, and orange chocolate cookies. My absolute favorite part is their dedication to high quality ingredients, and that they keep their customers in mind when it comes to knowing where your food comes from. All of their products are certified organic by Oregon Tilth, which means that the farm(s) where the ingredients are grown does not use artificial pesticides or synthetic chemicals. I had a bit of a shock when I read the calorie label on one of the bags of cookies. I was silly and for some reason thought organic meant low calorie. I'm laughing at myself now! But you know what? The trade off for great tasting, organic snacks is definitely worth it. I mean, we make cookies, buy cookies and candy and many of us never think twice about it. So, why not buy organic instead? At least this way you know the ingredients are quality, and much safer. We enjoyed everything, but there were a few products that we each thought were great. My daughter loved the pretzels and every single cookie. She's also a Fig Newman fan. My husband devoured the dark chocolate and milk chocolate peanut butter and caramel cups. He would have taken on the mint chocolate cups, but I made sure those were saved for me. He also really enjoyed the ginger snaps. Three of my favorites are actually going to be the prize in a giveaway, in addition to the chocolate peanut butter cups! 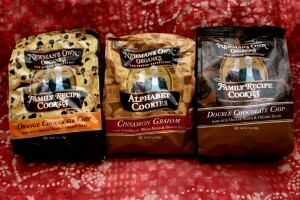 I liked the double chocolate chip cookies, the chocolate cream Newman O's, and the strawberry licorice. Can you tell I'm a chocolate fan? The chocolate Newman O's weren't quite as sweet and decadent as I had expected, but they were still yummy. Honestly I liked the pretzels better than others I've had, but I have more of a sweet tooth than a salty tooth(? ), so those didn't make my top 3 favorites, but they only missed it by a hair. Like I said earlier, the fluff balls in this house weren't left out either. Mazie and Phoebe (the dogs) received a box of food and treats. Mr. Bill, and Alex (the cats) received their own box of food too! It's time for the fun part! 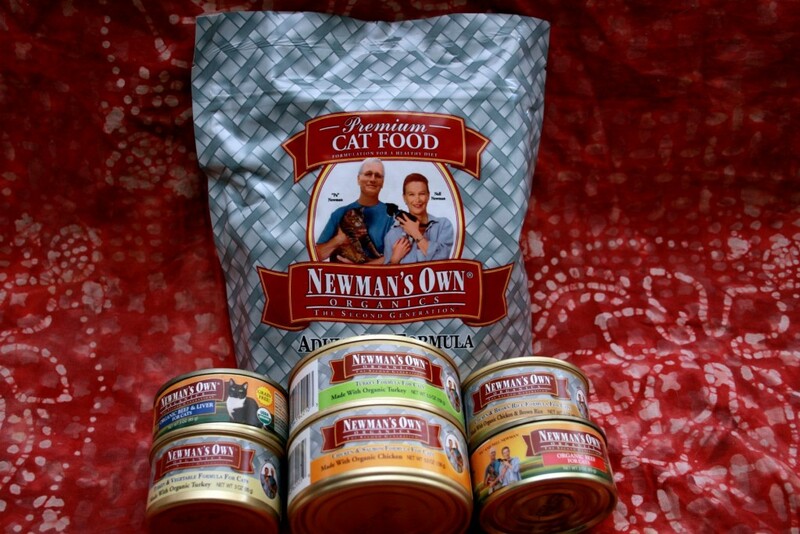 Newman's Own Organics is giving away FOUR products (the ones I chose as my favorite)! It was so hard for me to choose. One winner will receive a package of milk chocolate peanut butter cups - I will make sure the winner doesn't have an allergy, and if the winner does we can swap it out for the caramel or mint cups. The winner will also receive a package of licorice, double chocolate chip cookies, and a package of chocolate cream Newman O's! 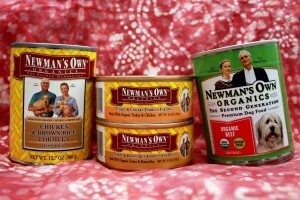 Make sure you find Newman's Own Organics on Facebook! Giveaway will go live at 6pm EST 03/10/12 and run for approximately a week. Only US residents ages 18+ are eligible. You will be able to enter [HERE]. I was provided with products for free in order to facilitate this review. All opinions are 100% my own. See Disclosure Policy. I've been a fan of the Country Bob's All Purpose Sauce Facebook page for quite some time now, and every time they've done a giveaway I've entered... and lost. I had never tried their product and yet I was desperate to do so. Recently they put out a call to bloggers, and I leaped at the chance! Why? Because EVERYTHING I had personally read so far on their Facebook page was nothing but compliments, and raves about how amazing this sauce is. A product has to be good if that many people say it is, right? RIGHT! Al from Country Bob's sent me two bottles of their All Purpose Sauce. (You can tell from the photo that the bottle on the right is just about gone.) We don't cook often, and when we do we don't usually eat meat, and I really didn't want to wait to try it until we happened to pick up steak at the store. I opened the bottle, and dipped my finger in. *Cue Angelic Music* My taste buds were in heaven! 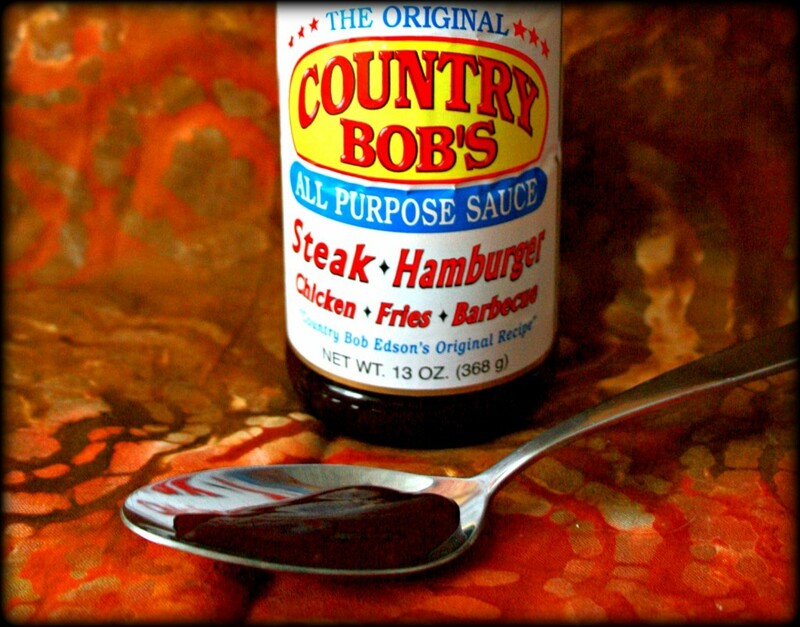 I like BBQ sauce, and I like steak sauce, and to me, Country Bob's All Purpose Sauce was the perfect combination of both. It was a little tangy, a little spicy, and perfectly sweet. It has a kick, but not one that's going to take your mouth off. Of course I made my husband try it. If you've read some of my previous reviews you'll remember that he is a picky eater. There is ONE brand of BBQ sauce he will buy, and ZERO brands of steak sauce. He loved it! He told me it was one of the best products I've reviewed so far, and actually thanked me! He did mention one thing we both noticed; that it wasn't as thick as we expected it to be. Not that it matters in the slightest, except it may be harder to keep the sauce on while BBQing if you don't generally marinade your food first. One thing I really liked is that I know what all of the ingredients are and I can pronounce them. I think that's a very important quality. And, even though I can't buy the sauce in any of my local stores (as far as I know), I can purchase it online! Which, I will most likely do in the near future since we've powered through 1 bottle already. Make sure you check out their other products as well. They sell BBQ Sauce, Spicy All Purpose Sauce, Seasoning Salt, and Apparel. I also loved the Country Bob's story. How it began as 1 man in 1968 trying to make the perfect sauce, something he would like. 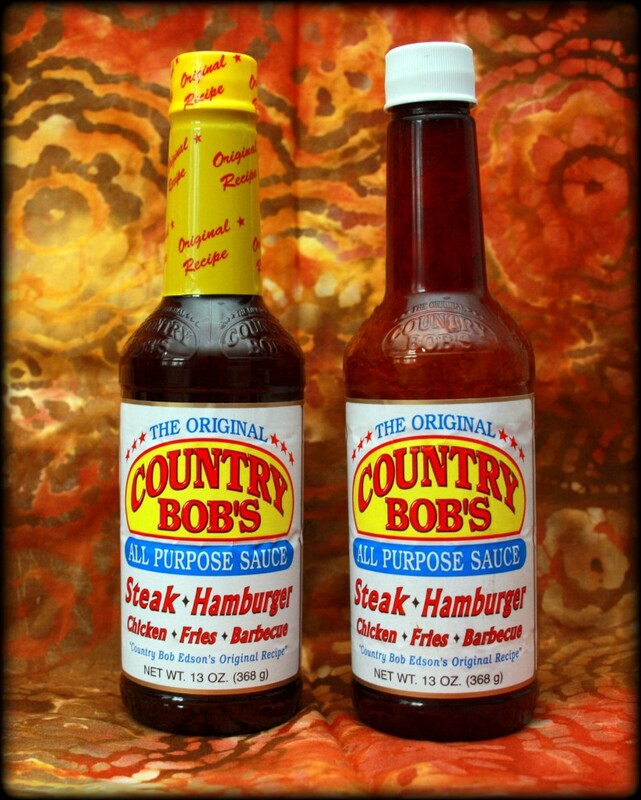 To learn more about the history of Country Bob's All Purpose Sauce, watch their video [HERE]. Also, you can follow them on Twitter! There is most definitely a giveaway with this review. (Thank you Country Bob's!) Two winners will each receive 2 bottles of Country Bob's All Purpose Sauce. Giveaway will run from 6pm EST 03/03/12 to 12am EST 03/11/12.